Well, ladies and gentleman, November is over and its time to look back upon it and gaze upon my fine works. Courtesy of WordKeeperAlpha here is how I did this month! 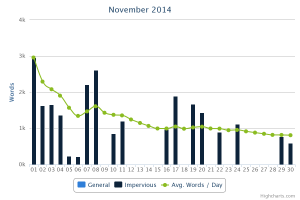 Final word count for the month was 24438 words, just about half of the required 50,000. Do I feel bad? Maybe a little, but not as much as I might for past years. I’ve won two years in a row so far and produced first drafts that needed to be all but rewritten before I felt comfortable showing them around. This year I was working on the second draft of Impervious, which I found out was perfectly legal to do, (legal for the official NaNo rules) provided I was writing all new words and not just editing existing ones. Turns out, pounding out that crap first draft is a whole lot easier than pounding out 50,000 words that you actually don’t mind showing people. While I didn’t hit that lofty goal, I did manage to get a fair chunk of the next draft finished and am now sitting on 11 finished chapters and will be starting in on chapter 12 … well, soon as I figure out what the hell I need to happen in chapter 12. Still, the writing will go on. Unfortunately, this means that I’m not going to be able to get the second draft done by the end of the year, which is going to change the date when the third draft gets done, yadda yadda yadda. What do you expect? I’m an author and we are a shiftless and lazy bunch. Still, I’m going to get this sucker wrapped up in 2015 and get the second draft of the sequel started on, with the goal of writing the first draft of part 3 next November. Big plans, I know, but I think I can hack it. 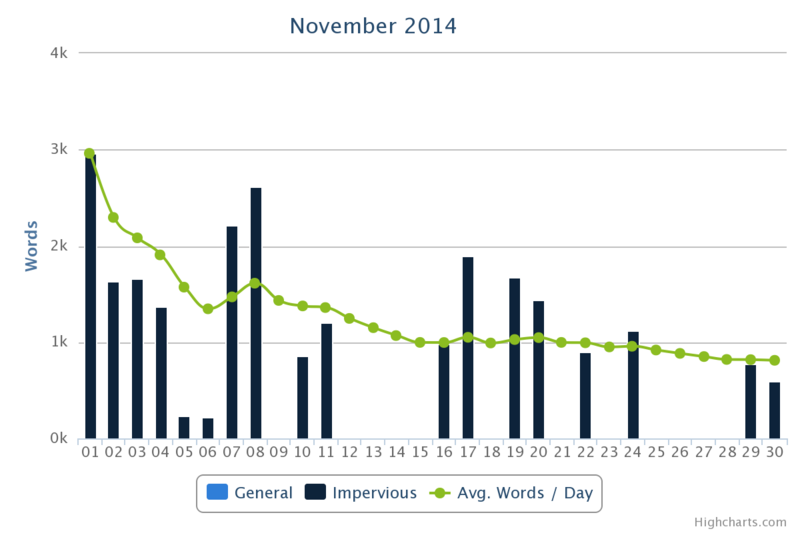 This year I managed just over 100,000 words, AND created the new and much improved WordKeeperAlpha. In 2015 I want to average around 15k a month, while still pushing out updates. It should be doable, seeing as how most of the core functionality is already in place and I’ll just be making regular updates and new feature releases. How did I do this year? Why, WKA knows that too! Yeah, November kind of kicked the rest of the months’ collective asses. August absolutely sucked in terms of writing, and so did September, but that’s when I was really focusing on getting WKA pushed out. 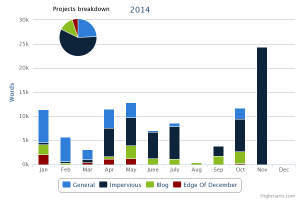 Still, next year, more writing every month should let me get a considerable amount done. I’m looking forward to it. Impervious is really coming right along and I’m excited to show it to people. I’m not writing December off either … well, I will be writing but… you know what I mean. Shut up. No, you shut up! Whubba? Oh, right. Sorry, I had a little moment there. I think my cold meds are starting to kick in. I’m going to go lie down for a bit. I’ll be back soon with some new WordKeeperAlpha news as well as the awesome thing that happened halfway through November regarding my little abomination of code and graphs. Later.